These look delicious! And your photo is so pretty. The colors are beautiful. These are my nieces favorite cookie so I will have to try these out! Butter and cream cheese are softening as I type...They will be mine, of yes, they will be mine! Sugar Cookie bars? That sounds to die for! I LOVE YOUR BLOG!!!!!!!!!!!!!!!!!!!!!!!!!!!!!!!!!!!!! These look great! Is it possible to substitute neufchatel or light cream cheese to make it a little bit healthier? So much easier than rolling out dough! Your directions don't mention the purpose of lining the sheet with foil? Would it work just as well to spray the sheet with Pam - or are you supposed to lift the bars out of the pan in order to cut them? @Kay-M Yes you can totally spray just the cookie sheet with Pam! That is what I did. I edited the directions just to do that. Thanks for bringing that to my attention. @Anonymous I know sometimes the lighter stuff works and tastes differently in recipes, but if you try it out, you will have to let me know how it turns out for you! I would love to know! 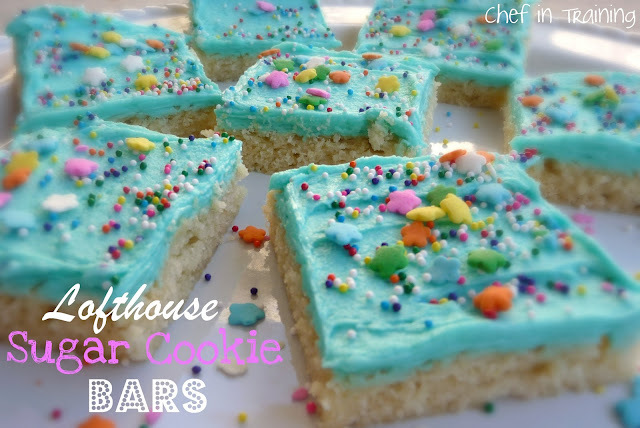 I make a lot of cookie recipes into bars. I can only bake one sheet at a time in my old oven so it does make things so much easier. Thanks for this recipe! I can't believe what a simple solution this is to hours in the kitchen when I want to bake sugar cookies! Thank you, your blog is seriously the BEST! Love how simple this are and they look fantastic too! I've seen these in cookie form throughout the month of December but never in a bar form. I love it! They look amazing!!! I need to try this recipe! Thanks! I made these this weekend for some friends and family and they were a huge hit! I can't wait to make them for other get togethers. So easy. Love your website! Shannon in Wisconsin. Good idea, but the cookies ended up more like cake. I don't like cakey cookies. I saw this on Pinterest. I made these last night. They weren't bad, but they're nowhere close to Lofthouse. They're more like regular sugar cookies. They lack the fluffiness of true Lofthouse. I just made these & they might be even better than Lofthouse! Thank you! I just made these and they are good but the center is doughie and I baked 20 minutes until edges were browned!! Just made these! So yummy and all easy! They are a big hit in my house! You can definitely make sugar cookies without all of the rolling and cutting. Just drop balls of dough on pan and you'll have circle cookies. But I LOVE this cute and easy idea! Fun, Fun, Fun! I made these this weekend, they were awesome. And made a TON! I used lemon extract instead of vanilla in the frosting, since that's what I had for a clear flavoring. The cookies took some patience to spread out perfectly, but the beautiful, uniform end result was so worth it. I was just about to type this, I was disappointed in the consistency. I thought they would taste more like a cookie. I loved these when I made them, but people were shocked that I brought treats to work that had NO chocolate in them. :) Any suggestions on how to make them chocolatey? I made these and they are amazing!! A hit with everyone who ate them, I will no longer have to painstakingly make individual sugar cookies!! Great recipe, but this font/layout make it really hard to read. Bars turned out great and we're very popular at Superbowl party. Yes, they are super sticky when you were trying to spread them in the pan. I am glad you gave me the warning but it was well worth the effort. I add a little lemon flavor in the batter. At first I thought it was a bit strong, but others seem to enjoy it.keep up with more delicious recipes.